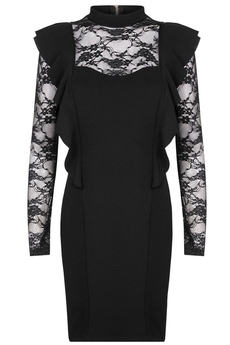 Mela Loves London Ruffle and Lace dress is perfect LBD for a night-on-the-town and any special occasion. Crafted in Italy, this figure hugging bodycon design features long lace sleeves and insert, on-trend fluid ruffles at the front and back and chocker neckline. Has exposed gold back zip fastening, is not lined and is approx. 90cm in length. Winter collection. Composition: 95% Polyester, 5% Elastane. Color: Black.